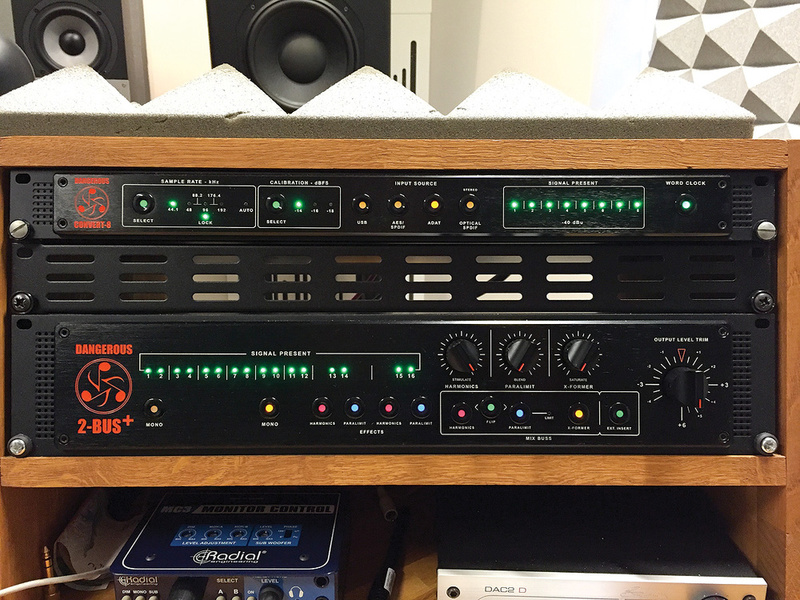 The 2–Bus+ is a 2U, 19–inch rackmount, 16–channel summing mixer. The front panel features a signal-present indicator for each channel. 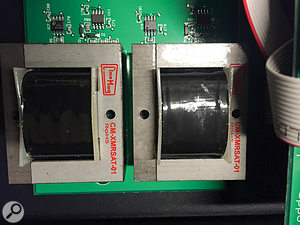 Below are two mono buttons, for switching channels 1–2 or 9–10 into mono. At a push of a button, channels 13–14 or 15–16 can be sent to two on–board audio processors (‘tone’ processors if you like), named Harmonics and Paralimit. These can also be patched to the mix bus and their sequence reversed. A third processor, X–Former, is only available on the mix bus. The output level from each processor is adjusted using one of three knobs. Conveniently, there’s also a button for inserting stereo outboard processing on the mix bus, via the I/O on the rear. Rightmost on the front panel is a stepped master output–level trim control ranging from –4 to +6 dB. The rear panel is equipped with 16 inputs (presented as both XLR and D–sub connections), insert points on XLR, and main and monitor outputs, also on XLR. Expansion XLRs permit the stacking of multiple units for configuring systems with 32, 48 or more channels. I’ve been using analogue summing boxes for over 10 years, so incorporating the 2–Bus+ in my setup was easy. Once set up, I sent a mix I was working on through the mixer and continued work. I have an eight–channel Dangerous Mixer, which is based on the same design as the original 2–Bus, so I’m familiar with the sound (or rather the lack of it) associated with the 2–Bus. Having made the switch to the 2–Bus+, I instantly heard a difference: the mid range became smoother and more detailed, and the stereo width even better defined. The difference was subtle but audible and immediately noticeable, and the signal indicators gave me clear visual confirmation that all channels from the DAW were playing properly — a simple but very useful feature that’s missing on most summing boxes. Making use of the insert points on the back, I patched in one of my stereo EQs, just to test the button on the front. It worked very smoothly when switching the EQ in and out of the signal path. The analogue channel inputs are, helpfully, duplicated on XLR and D–sub connectors. So far so good. But the fun began when I enabled the tone processors, especially the Paralimit feature. According to the manufacturer, it’s a FET limiter “set on stun” and, as the name suggests, it’s a parallel process: the compressed signal is sent to the mix using the Paralimit knob on the front panel. To my ears it sounds like the processed signal is first filtered by adding a lot of mid range and treble, then smashed by the limiter. The result is very refreshing on drums, acoustic guitar, vocals and so on — in short, any instrument that could benefit from some extra mid–range and treble energy without sounding ‘pokey’. The result is akin to that of a harmonic enhancer such as the Aphex Aural Exciter, but it’s smoother-sounding than that, and it’s very seductive — I wouldn’t mind having it available on all 16 channels! The Harmonics effect is a subtle affair. In fact it’s a very subtle affair and, again, it’s a parallel process. The knob on the front panel adjusts the amount of VCA–processed signal sent to the mix bus. Turning the knob all the way up first produced a very understated effect. I almost thought it might be a placebo, but I then tried applying it on a stem with more input level, and this made the effect more audible, adding some mid-range and treble harmonics. Given the subtle enhancement of the effect, I wouldn’t mind having a second turn on the Harmonics knob, or more audible processing to begin with. With the knob at 12 o’clock, the total distortion is about one percent, according to the manufacturers, comprising mostly even harmonics but with a dash of odd harmonics too. Swapping the Harmonics effect over to the mix bus produces a more audible effect still: there’s an increase in overall level which has to be accounted for when making comparisons, and when applied to the whole mix, you have to ‘mix into’ this effect to utilise it to its full potential, which again makes objective comparison tricky. All in all, though, I thought it a very nice processor. I have to admit that the X–Former effect had me perplexed at first, because whereas the Harmonics processor is subtle, this is not. Turning up the X–Former knob to 12 o’clock produced quite a prominent distortion on the mixes I was working on, which in these cases wasn’t particularly useful. To better understand the distortion pattern, I ran some instruments through the effect, and again this didn’t quite do it for me. So, I decided to dial back the knob a little, to about eight o’clock, and mix into the effect — and it’s then that I understood how best to use it. Properly dialled in and massaged the right way, the X–Former effect adds some heft and body to the mix, but a little goes a long way. With the X–Former knob turned fully down, no transformer saturation is applied, only the subtle effect of sending the mix through two Cinemag output transformers. The good thing, of course, is that you can choose whether to use the transformer saturation or not, because some material will benefit from it, and some won’t. It’s great to have the possibility of adding analogue coloration to the mix, and at other times leave the tone processors out of the signal path. Designer Chris Muth, the inventor of all Dangerous Music’s devices, told me that the circuit design has been improved in several ways. The biggest change over the last 10 years, he says, is that components have shrunk in size, and this means that it’s now possible to lay out the signal path in short, straight lines. Since there aren’t ‘mono’ circuits on every input pair, it was possible to cut out two amplifier stages and lots of summing nodes, which made the noise and distortion performance even better than before. The sound and performance of the three tone processors was developed over a two–year period, some of which was spent testing different circuit designs and transformers, but with much time spent making sure that they would be useful on different kinds of programme material (that’s no small task!). 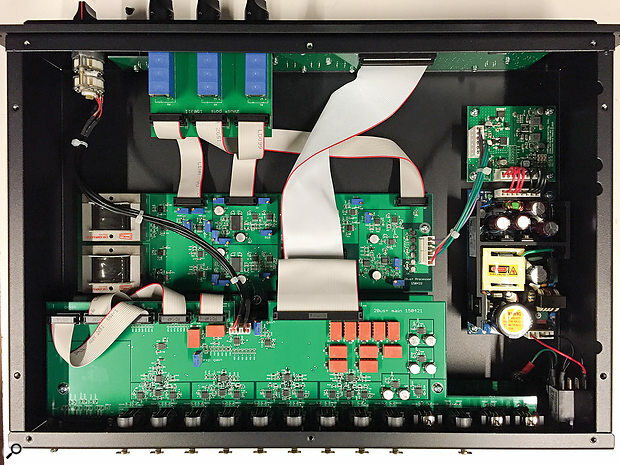 Regarding the active summing design, Chris says that years of experience and testing have shown that using balanced receiver amplifiers, summing op–amps and line drivers yields the best performance. There’s a widespread misconception that passive summing designs — using a simple resistor network to combine the signals, with a high–gain amplifier to make up for the resulting level loss — are more transparent, due to the lack of active electronics throughout. Chris points out that passive designs have several potential problems: there’s no common–mode rejection, which is something that’s crucial when looking to ensure the best noise performance possible; and there’s no isolation of the D–A converter’s ground from the audio ground of the summing circuit, which could lead to poor crosstalk rejection and poor imaging. Active designs allow for a local ground reference for the inputs, which is the same ground reference as the summing op–amp, and this contributes to a clean, quiet and low–distortion summing device that is stable. In other words, well–designed active summing performs better than passive summing. As I mentioned earlier, the debate about whether analogue sub-mixing is needed or not is still very much alive. For sure, mixing in the box can produce great results and offers the convenience and simplicity of instant recall. Load a mix and continue to work — in the studio, or on location using a laptop and headphones. But breaking the mix out into analogue stems doesn’t have to jeopardise the ability of recall, as long as the summing mixer has a few clearly marked knobs and buttons. Also, it makes it possible to employ external outboard in a very creative way. The laptop jockey might add an SSL compressor plug–in on the drums, whereas I personally prefer a real SSL X–Logic compressor on the drums. The same goes for mix–bus processing: applying a stereo compressor and EQ plug–in on the mix just does not, for me, generate the same sonic excitement as using the equivalent outboard on an analogue mix. There’s a difference in workflow and, personally, working in the box feels like laying a thousand–piece jigsaw puzzle where every piece has to fit. Working with analogue summing somehow makes the puzzling that bit easier, and enables me to make broader strokes on the sonic canvas without collapsing the mix. Will analogue summing make a difference for you? Maybe, maybe not. There’s really only one way to find out: try it yourself! Please don’t rule out analogue summing simply by listening to sound clips on the Internet. To really hear if there’s a difference, you need to try it out yourself. It is worth noting that the quality of your converters comes in play. To properly capture the analogue mix in its full glory, you have to use a high–quality A–D converter. As for the quality of the D–A side of things, I had the good fortune to use another new Dangerous product, the Convert–8, an eight–channel D–A converter, the sound quality of which is sublime. Along with an eight–channel Mytek 8x192 converter, the mixes produced by the 2–Bus+ were deep, wide and punchy. The mid–range smoothness and depth, and low–end firmness, are testaments to its design. The Dangerous 2–Bus+ is a very competent active summing mixer, and the three analogue tone processors act as ‘vitamin injectors’ for stereo stems or the entire mix: super–clean sonics, FET–limited sound, or transformer saturation, the choice is yours. It’s clear that a lot of thought has gone into the design. The simple layout of the front panel and the signal-present indicators make it very intuitive. Small things like the mono buttons on channels 1–2 and 9–10 make it perfect for users with two different kinds of eight–channel DACs connected to the 2–Bus+. It would have been possible to add more controls to the audio processors, but it would have been trickier to recall all the settings, and there’s always the option of insert processing on the mix bus. The uncluttered front panel makes it easy to document and recall settings. It’s way more versatile than most of its competitors — and so much more than just another ‘summing box’. Well worth a try. There are a lot of different analogue summing boxes, including passive designs like the Roll Music Folcrom and Burl B32, tube designs such as Tube–Tech’s SSA 2B and Tegeler Audio Manufaktur’s TSM Tube Summing Mixer, and active solid–state designs like the SSL Sigma, Inward Connections MIX690 and SPL Mixdream. Some have output transformers, while others don’t, and some offer other saturation options, but none of them I’ve tried offers the same flexibility or sonic diversity as the 2–Bus+. For more examples, check out the Spotlight article in SOS June 2012 (http://sosm.ag/spotlight–summing). Clean, wide and punchy sound. The Paralimit processor is very seductive. It’s more than just another summing box. Dangerous Music’s latest take on analogue summing sounds even better than its predecessor, the excellent 2–Bus. With three analogue signal processors, it’s much more creative than its obvious competition, and the layout and signal path have been very well designed, with recall in mind. Most important of all, though, it sounds great! Mastering Works +49 (0)1762 408 0116. Dangerous Music +1 845 202 5100.